Collegiate athletic centers are more significant than ever before because fitness and recreation are increasingly important components of modern students’ lifestyles, observe architects Edwin M. Wallover III and William R. B. McCullough. That trend, they add, drives a need to make such facilities as flexible as possible – which is just what they accomplished in designing and building Bucknell University’s spectacular new aquatic center. The Arthur D. Kinney Natatorium was designed with a practical mission in mind: From the outset, the facility was intended to provide long-term performance, outstanding aesthetics, ease of operation and minimal maintenance life cycles while enhancing the university’s recruiting efforts and fostering individual and team achievement. In this case, however, the “individuals” aren’t just star athletes pursuing records and titles. Rather, the natatorium on Bucknell University’s Lewisburg, Pa., campus is unique in the sense that the school chose not to segregate varsity athletes from general student/recreational users. Indeed, the facility, part of the university’s grand Kenneth G. Langone Athletics & Recreation Center, is designed to bring everyone on the campus together and provide a social hub for students. As architects, we knew that system performance, aesthetics, constructability and budget would all play major roles in the developmental process. At the same time, the mission statement made sure we created an environment that encompassed the university’s desire for a prestigious aquatics facility as well as the needs of swimmers at a wide range of program levels. Our firms – Ewing Cole Cherry Brott of Philadelphia and Wallover Architects of Lancaster, Pa. – collaborated on the design and construction of the project and are proud to have been part of the team that made it all happen. From the university’s trustees, major donors and steering committee to our specialty consultants and in-house project teams, everyone played critical roles in turning the mission statement to a functioning reality. Bucknell University’s main quadrangle is located on a hilltop. The Athletics & Recreation Center is positioned in the valley below, with the main entry on axis with the quad above. The valley was the perfect place for such a large building because it conceals the center’s mass while maintaining high visibility. In addition, the location is central to the flow of campus traffic, reinforces the campus axis and provides great views up the hill to the main quadrangle. Exploiting this high-visibility location and the identity of the new center at the core of the campus – as well as the potential synergies between existing facilities and new components of the recreation center – were all of primary importance as the project commenced. The overall architectural program was accordingly designed to form an edge of the main campus. The center’s visual connection to the campus is secured via large glass openings in the brick arcade that borders the center’s front lawn, and everything is designed to fit into the Georgian architectural style that prevails on the rest of the campus. Because of a high water table at the project site and unconsolidated soil conditions, the engineering specifications called for use of a double mat of steel reinforcement and pneumatically placed gunite in construction of the pool shell. This was intended to minimize the potential for structural or shrinkage cracking within the vessel. Helpfully, the monolithic nature of this technology and the rectangular, square-sided contouring of the vessel provided us with an ideal substrate for the ceramic mosaic tile we set on the pool’s interior surface. A primary design goal was to create vitality within the space by making visual connections through openings that bring light into the facility while effectively making it transparent. We saw this as a way to “activate” the aquatic facility, which is situated between two other major components of the overall project – the Krebs Family Fitness Center and the Gary A. Sojka Pavilion – and as a way to make all of the facilities work together. This open visual approach drove some interior design decisions as well. For example, the diving platforms are positioned at the closed end of the building, away from all of the natural light, to minimize glare for the competitors. By contrast, the shallow, recreational area is adjacent to a day-lit area and an arcade that provides views back to the main campus and into the adjacent fitness center. An additional glass wall divides a spectator concourse that is shared on the second level between the pavilion and the natatorium. As a result of these configurations, students can now enjoy the sight of 100 foot-candles of light dancing off the surface of the pool as they approach the building at night – or they can take in a league swim championship as they work out in the fitness center. The fact that Bucknell’s “Bison” teams had an existing pool facility gave us yet another unique opportunity to connect the natatorium and the fitness center. Eight brick arches on what used to be the exterior of the old swim center have now become part of the interior of the new natatorium. 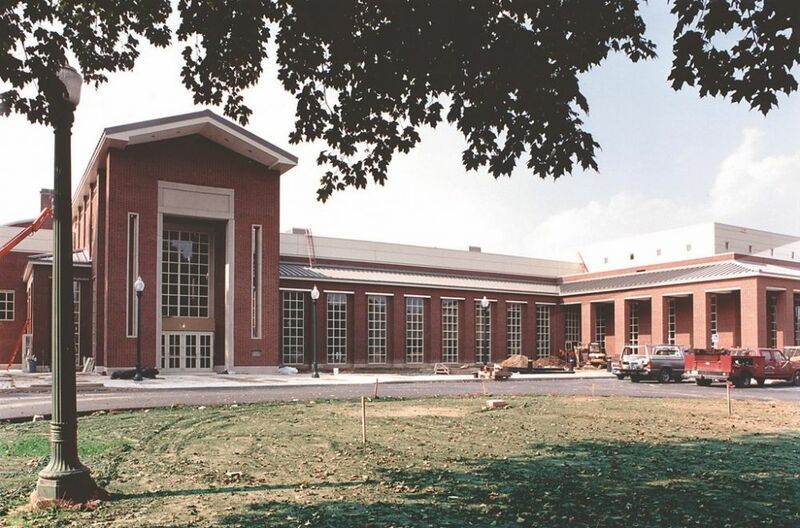 We filled five of those arches with glass that now separates the natatorium from the fitness center, allowing for ready visibility in both directions and connecting the spaces while making a gesture to campus history. The old pool is now an instructional weight area – an extension of the fitness center perched eight feet above the new pool’s deck. Kinney Natatorium is three times the size of the original and is equipped with two moveable bulkheads that divide the water into three separate spaces. The fact that the university would be getting three pools in one led to the decision to eliminate the old pool rather than incorporate it into the new design. The most important things to consider in designing aquatic spaces are twin needs for negative pressure and for protection of materials. [ ] Negative Pressure. 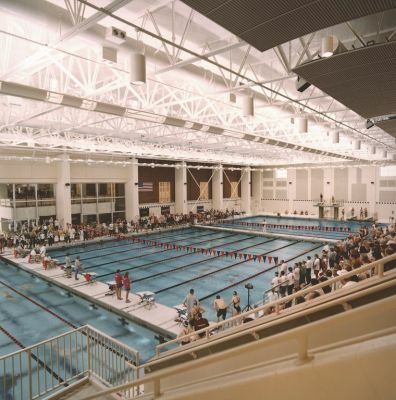 Placing an Olympic-size pool between a new 4,000-seat pavilion and a 15,000 square foot fitness center as we did for Bucknell University means the air system must be balanced correctly and that the system must be set up so any incidental odors stay within the aquatic space rather than bleed into surrounding spaces. When you enter an athletic or recreational complex and smell the pool before you see it, it means the pool space’s ventilation system is under positive pressure, allowing air to leak from the pool environment. By contrast, a successful system design will create negative pressure within the pool space so that when spectators open the door into the pool, they may feel a slight pull into the space. [ ] Surface Protection. Setting up for negative pressure has the added advantage of containing corrosive air, which means we only needed to concern ourselves with materials in the pool space. This meant a considerable savings, because it also means that only portions of the facility exposed directly to the pool needed treatment with (very expensive) high-performance protective coatings. In this case, that still left a lot to be treated – including all exposed steel elements, which were coated with a three-part application of protective paint, and the structural and miscellaneous steel, which was shop-coated with a zinc-rich primer, then finished on site with two coats once all field welding and final connections were completed and the building was enclosed. The roof deck was also a concern: All surfaces were coated, all penetrations were limited and everything possible was done to deny rust, corrosion, mold or efflorescence any opportunity to develop. In addition, most of the railings and ladders are stainless, while the window systems and doors are anodized aluminum. Other preliminary decisions had to do with programming and anticipating how the facility would actually be used. Challenged by Bucknell’s administration and staff to provide a pool that served the interests of competitive athletes as well as the general student population, we embarked on a process of identifying the major user groups, had them articulate their most desired features and examined the effect of a daily schedule of operations in reaching the final design. These factors became the basis for a pool that provides flexibility of use while not inhibiting the necessary competitive attributes. 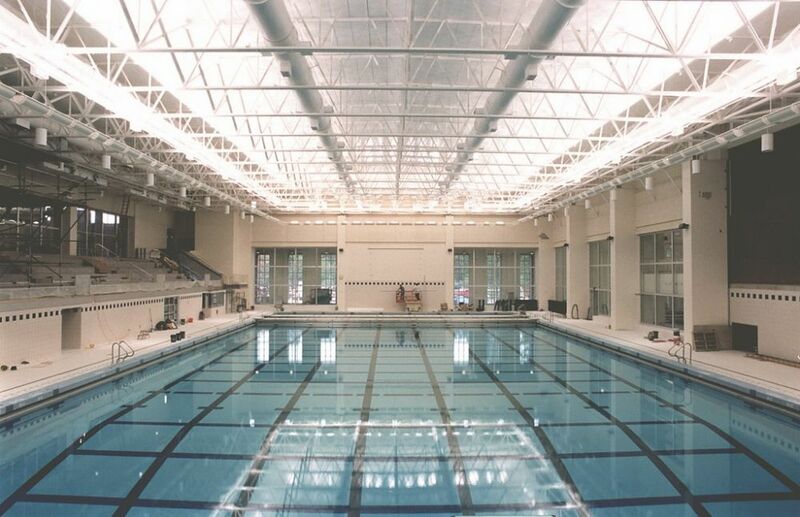 Long- and short-course competitive swimming, one- and three-meter springboard diving (with provision for a future platform-diving stand), water polo and recreational swimming are all possible within the natatorium courtesy of the two movable bulkheads we set up in the 75-by-174-foot, ceramic-tile-clad vessel. Simple relocation of the four-foot- and six-foot-wide bulkheads – manufactured by Neptune-Benson of West Warwick, R.I. – enables simultaneous programming via eight distinct bulkhead locations – two practice, one recreation and five competition configurations – programmed into the pool’s operation and marked along the deck. These configurations provide virtually unlimited flexibility for collegiate activities as well as invitational, regional or national meets. We recommended a slight oversizing of the pool on its long axis (an inch and a half or two inches at each end) to provide a margin of safety in maintaining the distance accuracy needed for competition. The bulkheads can be precisely located within the vessel at sanctioned course lengths, and the flow-through design of the bulkhead grating minimizes the effect of rebounding waves during time trials or competitions. In addition, multiple pool depths are provided to accommodate a limited non-swimmer area, swimming competition and the future five-meter platform-diving area – all without compromising the need for speed. In order to create a competitive venue that would enable Bucknell to attract the best and brightest athletes to its aquatic programs, we needed to ensure a “fast” water surface. The fact that we managed to do so was confirmed at the 2003 Patriot League championships, when 20 meet and 16 league records fell during the pool’s inaugural event. This outcome for the Bucknell Bisons was clearly what we had in mind when the pool was designed. In setting pools up for speed, we’ve never been convinced that cavernous concrete gutters provide a greater degree of evacuation of surface pool water during competitions – and certainly don’t provide enough of an advantage to justify the challenge of long-term maintenance of such features. Our design team tackled three key issues in wrapping up the design for the Arthur D. Kinney Natatorium at Bucknell University. [ ] Noise control: We used end-wall acoustic panels as well as a floating, perforated, sound-absorbing, anodized aluminum deck over the seating area. In addition, at some point in the future, the acoustic package will be augmented by hanging baffles from the trusses in two rows down the long axis of the pool. [ ] Lighting: We selected an indirect metal-halide lighting system made by SPI Lighting Group of Mequon, Wis., setting it directly over the perimeter of the pool so fixtures and lamps can be replaced from a lift on the deck. The ceiling and trusses are white to provide maximum reflectance. We also set up metal-halide downlights over the deck as a supplement to the indirect system. This was needed to help the facility meet NCAA requirements for 100 foot-candles of light for competition. [ ] Air Handling: We set up the system with an eye to making certain the ductwork didn’t disrupt the indirect lighting system or compromise aesthetics. The air-return registers were set up on the diving end of the pool as low as possible on the end wall. Two roof-mounted units manage air temperature and humidification levels, and their registers blend visually with the acoustic panels in the west end wall. Of course, all of these system considerations are integrated on one or more levels. Taking advantage of natural lighting at one end of the pool, for example, meant a potential opportunity for condensation, so we prevented it by setting up diffusers aimed to wash the windows with conditioned air. For the most part, however, condensation isn’t an issue because the building design includes an interior corridor that acts as a buffer between the pool and the exterior. By narrowing the temperature differential between the indoor spaces, we limited chances for the formation of condensation – and used a similar strategy to keep condensation away from the glass arcade between the fitness center and the pool as well as the glass wall separating the pool and pavilion concourses. In this case, we worked instead with available, pre-engineered technology that had proved effective on other pools by selectively and carefully modifying a standard Neptune-Benson 316L stainless steel re-circulating gutter system. It enabled us to develop a water surface that provides high-quality distribution of sanitized and filtered water while significantly reducing rebound from the side walls of the pool and minimizing the effects of filtered-water return inlets on swimmers. The modification had mainly to do with increasing the overall depth and profile of the gutter, which had the effect of moving the filtered-water inlets to deeper positions relative to the surface. The deeper gutter retains more water during competition, while multiple suction dropouts at the rear of the gutter assembly maintain the trough at desired levels and provide another measure that works against rebound. The precision of the stainless steel gutter also produces a uniform rim flow around the entire perimeter of the vessel, thereby minimizing cross-effects from multiple, simultaneous activities. All of this is achieved without multiple piping penetrations in the pool floor, as would have been required had this been a bottom-fed containment structure. The depth of any competitive course also plays an important role in the overall success of the pool. In Kinney Natatorium, the depth of the 25-yard and 25-meter competition courses ranges from eight to nine feet – adequate to eliminate any significant bottom rebound. For long-course (50-meter) events, the shallow end begins at approximately five feet. To keep the vessel’s 942,000 gallons of water in top competitive condition, we selected re-circulation systems that would minimize the number of penetrations within the pool shell while providing an even distribution of filtered water throughout the complex. Another key design request was for a filter plant that would be easy to operate and maintain. In this case, we chose a multiple-cell, horizontal, high-rate sand filtration system consisting of four 60-inch-diameter Neptune-Benson fiberglass filters arrayed in two stacked groups. Each array is driven by a 40-horsepower, close-coupled re-circulation pump, and each is capable of moving 1,280 gallons per minute – a total water volume of water of 2,560 gpm for a six-hour turnover rate. The sand filters’ media is augmented with a 6- to 8-inch layer of Neptune-Benson’s ClinoPure, a refined form of Zeolite. This additive has proved to be highly successful in providing outstanding water, and it also influences air quality by reducing odors associated with nitrogen compounds within the finished space. During initial start-up of the pool, we flipped a quarter into the water from the three-meter diving platform and could see that it came up heads – not bad for a 14-foot depth! The pre-cast concrete seating deck for loyal Bucknell Bison spectators was designed for comfort, as was the air-handling system installed in this area to provide a slightly lower supply temperature to keep spectators cool. This is a delicate balancing act: Too much cool air could potentially spill over the seating deck onto the pool deck, displacing the warmer air and giving swimmers a chill. To avoid that situation as much as possible (and to save cooling costs), this subsystem only runs when the seating section is occupied for an event. While most mechanical systems are controlled strictly by temperature, the control system deployed here continuously monitors both temperature and humidity and maintains them at ideal set points. There are also carbon dioxide sensors: In high-occupancy conditions, outside air dampers will automatically open to increase the fresh air supply into the environment. In setting up the control and monitoring systems, we worked closely with the team of building engineers, integrating the pool systems into the natatorium’s overall environmental-control system. A combination space heating/dehumidification system also provides start-up and maintenance heat for the pool water, which is maintained at 82 degrees F with an air temperature of approximately 84 degrees F and relative humidity in a range between 52% and 55%. These levels provide for comfort that has been well received by students, athletes and faculty. The attention to detail applied with the pool’s main systems was similarly applied to our work on the surrounding structure and fixtures. As the second, third and last sidebars above relate, our focus was always on the nature of the environment and on ways of making the facility easy to maintain, comfortable for spectators and well suited to the needs of its competitive and recreational users. If our ultimate aim was to create a “place to be” for students and athletes on the Bucknell campus, then we’re confident that Kinney Natatorium is just such a place. 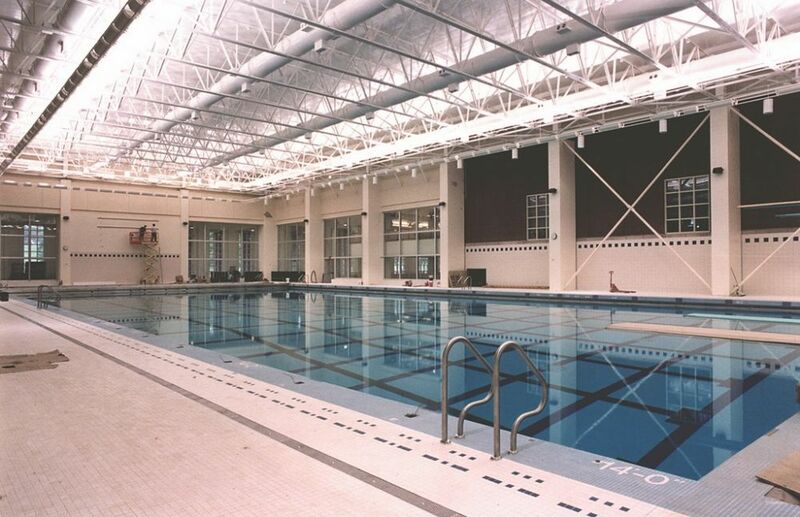 The facility uses common materials in combination with readily available manufactured components, and the result proved to be an easily constructed pool that met the university’s budgetary and programming requirements. We’re pleased that the solutions our team developed went so far toward complementing the functional needs of spectators and competitors while meeting the recreational swimming needs of Bucknell’s diverse student population. The dual-purpose, competitive/recreational requirement was somewhat unique, but the challenge led to interesting choices and some unique design solutions. William R.B. McCullough, AIA, is a sports architect for Ewing Cole Cherry Brott, an architecture and engineering firm based in Philadelphia with offices in Cleveland, Los Angeles and Washington, D.C. McCullough joined the firm, of which he is now a principal, in 1997, and serves as a project design architect who specializes in meeting the unique needs of collegiate athletic facilities. His skills include facility planning and programming with an understanding of the technical implications of seating and sight-line design as well as the coordination of specialized equipment for athletics. Edwin M. Wallover, AIA, is president of Wallover Architects, an architecture and engineering firm in Lancaster, Pa. He directs the development of athletic and aquatic projects, including their programming, planning and design standards. Wallover has 27 years of experience in a variety of projects for residential, commercial and municipal clients and is often involved in the development of project programs, functional planning concepts and alternative design strategies.